If you are looking for a rangefinder that offers scan abilities, and also comes equipped with excellent optics, you will discover that this model from Leica pretty much checks all the boxes. You will be pleased with this weather-resistant model, and also with the fact that it can take a lot of wear and tear. We would add that something like this should be expected for the price, seeing that the Rangemaster is far from being cheap. However, if you are looking to invest in a rangefinder that provides superior performance and money is not an issue, we recommend this model. A simple look at the specs will tell you that his model is a good option for a seasoned hunter. Reasonably portable and weighing just 7.7 ounces, it is the kind of rangefinder for which you can quickly find a place, be it in a pocket or a rucksack. As the materials used for the body are die-cast aluminum and carbon fiber, you can expect it to be quite durable, something that Leica has gotten its customers used to, as all the products it makes are reliable like this. Featuring 7x magnification and an objective lens of 24mm in diameter, it offers a higher performance when compared to other models. It uses a Class 1 laser that is safe for the human eye, and it has a measuring range that goes up to 1597 yards. The rounded range for this unit is 1600 yards, and it starts from 11 yards. However, you must bear in mind that this value applies only to highly reflective targets. Nonetheless, the Rangemaster proves that it deserves its name, as anything else that isn’t reflected can be spotted and calculated the distance for, at 1,000 yards. Even deer can be identified at ranges of up to 700 yards, which is something that cannot easily be said about other rangefinders available. The accuracy varies as you go further. Up to 500 yards, the error is within +/- one yard, and it doubles for distances as high as 1,000 yards. After that, the error becomes a percentage of the range – +/-0.5% yards. Even if you cannot say you’re impressed so far, some things highly recommend this model. For instance, once you press the second button on the unit, you will receive a plethora of useful details, such as the angle, the temperature, and the atmospheric pressure. For a seasoned hunter, all this data might provide necessary input for the following decisions to make. The Rangemaster also has multiple modes, such as scan, for determining the distance from a target on the move, and the ballistic curve mode that established extra details for increased shot accuracy. Of course, the kind of ammunition you used will play a role in getting this mode to work accurately. 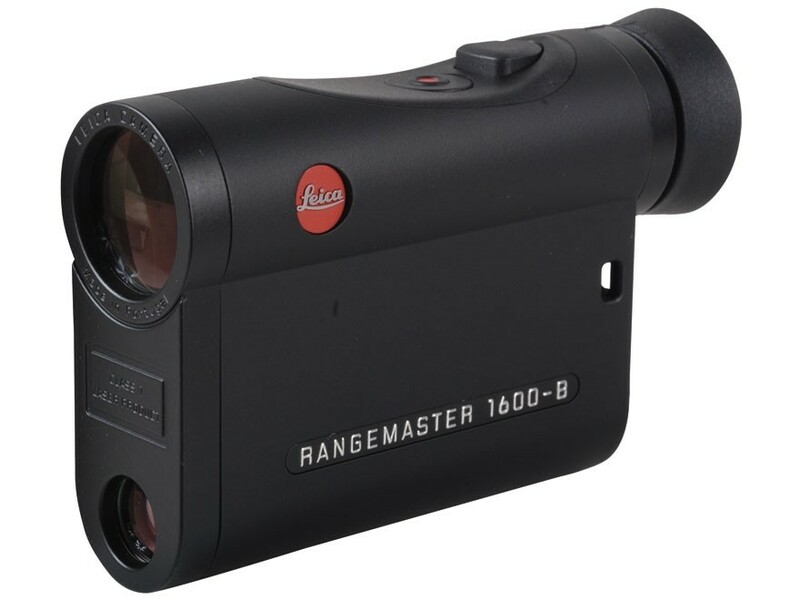 With a roof prism system and a 24mm lens, the Rangemaster offers good quality optics. The eye relief of 15mm is convenient and can help people with glasses to get the maximum out of using this particular model. The lens is coated with AquaDura, HDC, and it is also phase coated, so the overall optics capabilities are superior. Even in low light conditions, you will be able to read the LED display that performs well in any circumstances. The image you will get is sharp, too, while the field of view of 345 feet at 1,000 yards is satisfactory, as well. The focusing abilities are superior, also, and you will get a model with fast, accurate operation. You can rest assured that this model will last for a long time, which brings peace of mind, seeing how it is not exactly cheap. The Rangemaster is both waterproof and fog proof, something that cannot be said about many models on the market. You can even immerse it in water for half an hour and still notice no problems. One downside for a model that is this expensive is that it doesn’t come with many extras. However, you will get a high-quality carrying case made of Cordura that will protect the rangefinder and keep it in pristine condition for the next time you want to use it. The Rangemaster from Leica is not a cheap model, but it comes equipped with performance features that make it worth the expense. Its range can go as high as 1600 yards, and it has unique modes that calculate the angle between you and your target, for the most accurate readings. As expected from Leica, the optics quality is superior, and overall, you will feel satisfied with using this product.